What have I been up to recently? Well, I made a blackberry cobbler. Edy's Vanilla Bean ice cream is fantastic. The fridge always has our meal plan for the week and my chore charts. It rained the other day and I had left my raincoat at home so when I left work I got soaked. I was honored when my Sister-in-Law asked me to make some cookies for a baby shower she was hosting. I had made some sugar cookies before Christmas so she asked me to make some of those and make them girly since her friend is having a baby girl. I think they turned out pretty cute. :) It's a great recipe. The cookies are light and fluffy. They really taste more like shortbread or tea cakes rather than sugar cookies, which I like. I prefer a less sweet cookie and this recipe is perfect for that. If you're interested, I used the sugar cookie recipe from the I Heart Naptime blog. I went to Hobby Lobby recently and found this super cute apron, except the material it's made out of is awful so I didn't get it. And I have been working on some fun labels for my homemade cleaners. So that's it for now! Here at Thrive.ink we believe that as a whole living life is an amazing opportunity! This site is dedicated to loving life and all it has to offer. Thrive.ink is a collection of experiences, guides, stories, and pictures that hopefully inspire you to enjoy this world with us! Hi! I'm Morgan. I am an event planner, party stylist and I design custom party decorations. I love helping people have stress-free, beautiful events! 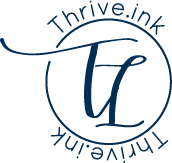 Welcome to Thrive.ink Event Planning! Sign up for our newsletter and be the first to know about new products and special offers.